A charming map of British New York from Manhattan to Lake Ontario. 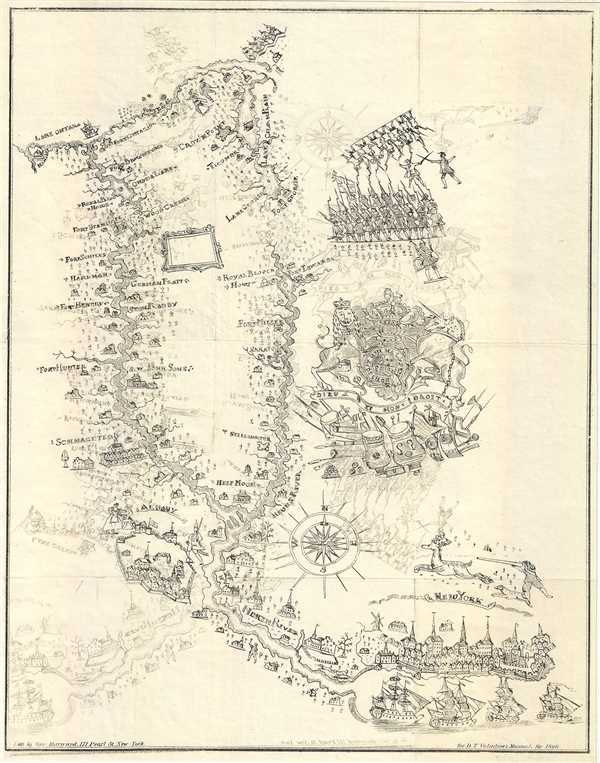 A charming map of British New York from Manhattan to Lake Ontario, featuring the British Crest, a hunter shooting a deer, British soldiers in battle formation, towns along the Hudson River and the Mohawk River, all the way to Lake Ontario. It is unclear if the unnamed waterway to Lake Ontario is a combination of the eerie and Oswego Canals, the shortest water route from New York City to Lake Ontario, as it is unnamed. Drawn by George Hayward of 171 Pearl Street for the 1860 edition of D. T. Valentine's Manual. Very good. Minor wear along fold lines. Offsetting throughout.